The most romantic dinner of the year in the most romantic Hotel of the city. There is no better day than Valentine's Day to pay tribute to your love and enjoy an intimate and special evening in the company of the person who makes your heart beat. 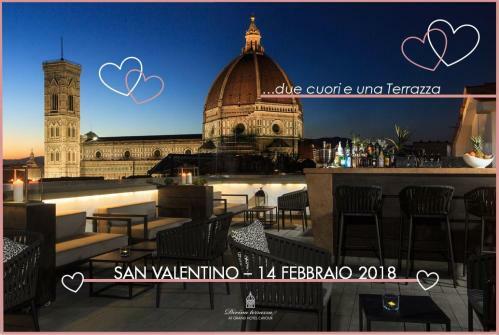 Our Chef, Mirco Malevolti, has created for the occasion a tasty and aphrodisiac proposal, which will certainly be able to amaze the person you love. A menu for two, full of every delicacy and embellished with a sweet dessert. The ideal ingredients for a candle-light dinner. For those who wants more ... you can book a table on the wonderful Panoramic Terrace of the Grand Hotel Cavour to admire the wonderful 360° view, tasting champagne, strawberries and chocolate.